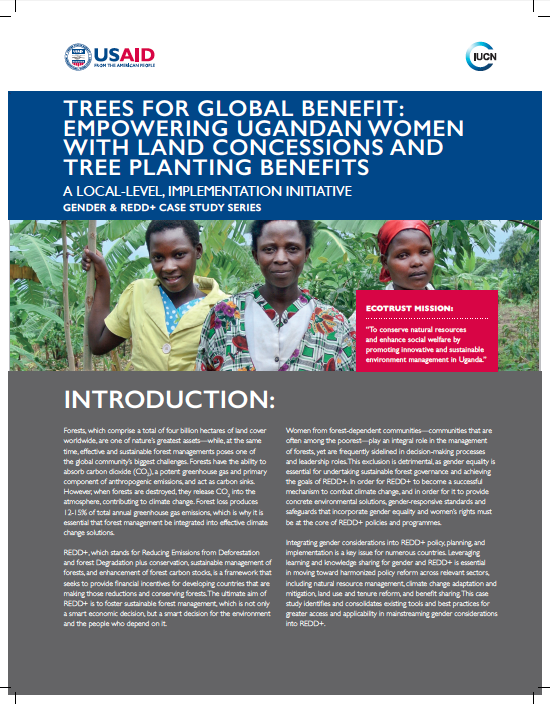 Trees for Global Benefit (TGB), an initiative of the Environmental Conservation Trust of Uganda (ECOTRUST), is a cooperative community carbon offset scheme developed to enable poverty reduction through effective management and protection of forestry ecosystems on which local people depend. TGB seeks to reduce unsustainable exploitation of forest resources and the decline of ecosystem quality, while diversifying and increasing incomes for rural farm families. This is most often achieved through Payments for Ecosystem Services (PES), decreasing unsustainable pressure on natural resources, reducing CO2 emissions, and building community resiliency. Small-scale landholders in rural areas have been involved in tree planting activities since TGB’s inception in 2002. Integrating gender considerations into REDD+ planning and implementation is a key issue for numerous countries. Leveraging learning and knowledge sharing for gender and REDD+ is essential in moving toward harmonized policy reform and is relevant across many elements of climate change adaptation and mitigation, natural resource management, land use, and benefit sharing. This case study identifies and consolidates existing tools and best practices for greater access and applicability in mainstreaming gender considerations into REDD+.